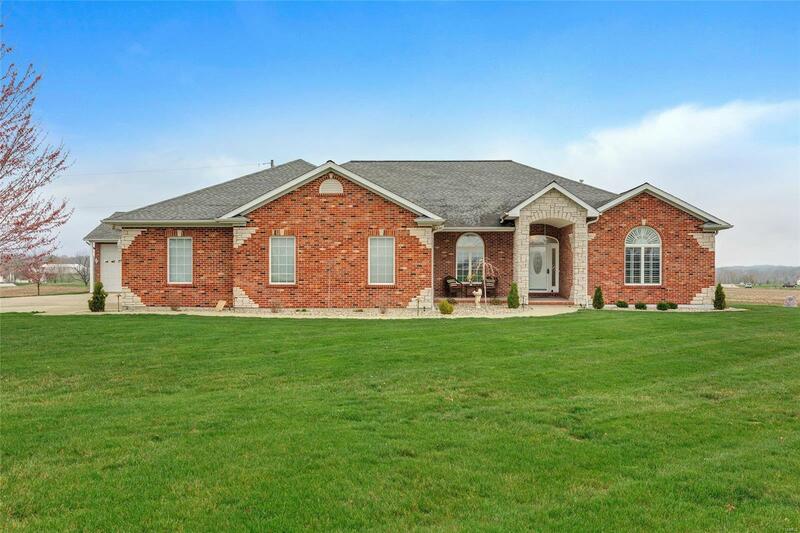 Gorgeous 4 bedroom Waterloo home nestled on just over 6 acres! The serene setting, beautiful brick/stone exterior, front porch, & tidy landscaping make a great first impression. Step inside to find the inviting family room featuring lovely hardwood floors, see thru fireplace flanked by built in shleving, & french doors leading to the sun room. The family room leads to the custom kitchen boasting a large island, breakfast bar, dining area, & custom cabinetry. The large main floor master suite features tray ceiling, see thru fireplace, large walk in closet & attached master bathroom w/ dual vanity, whirlpool tub & separate shower. Also on the main level find a 1/2 bathroom, formal dining room w/ tray ceiling, laundry room w/ mop sink, bedroom 2 w/ hardwood floors, & bedrooms 3-4 w/ carpet, walk in closets & jack & jill bath. Other items of note include the covered back patio offering scenic views, 2 car attached side entry garage, 40 x 36 3 car detached garage, & 60 x 80 outbuilding.